Two members of the PNP Aviation Security Group at Ninoy Aquino International Airport (NAIA) were sacked over the alleged "Tanim Bala Scam." Police Officer 3 Careen De Padua and PO1 Rommel Ballesteros were relieved after the bullet in the investigation report did not match with the one they presented during the inquest proceedings for Gloria Ortinez, the Hong Kong-bound overseas Filipino worker who was arrested for allegedly bringing a bullet at the airport. The 56-year-old domestic helper, who planed in from Laoag, Ilocos Norte, was nabbed on October 25 after Office for Transportation Security (OTS) personnel claimed she had a bullet in her bag. 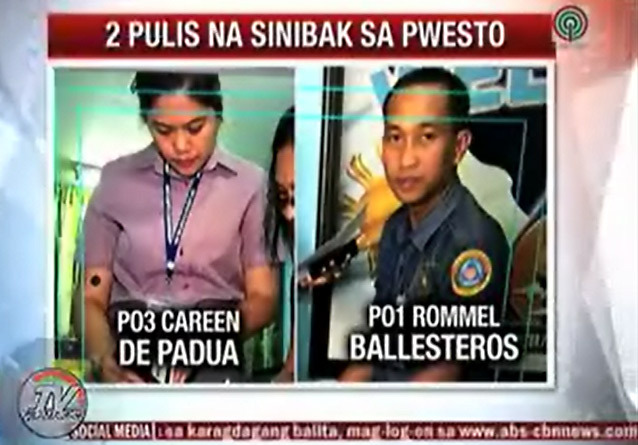 Three OTS security screening officers identified in an ABS-CBN News report as Phil Anthony Abella, Eureka Gala, and Robelinda Rosal, were also asked to explain as they also signed the sworn statement for the submitted evidence. The fiscal's office ordered the temporarily release of Ortinez from detention while the case is being investigated. Because of this development, her camp has come up with greater suspicion that the bullet found in her bag was planted.